Voices in Cloth 2016 proudly features a special exhibit of 20 of Julie Silber’s favorite quirky antique quilts. These unique pieces all have in common an unusual twist on the ordinary, a certain verve, and a gritty individuality rarely found in more studied and self-conscious quilts. These playful pieces demonstrate that all over America original works of art may be as close as the blankets under which we sleep. Julie Silber is one of today’s most respected quilt authorities, a qualified quilt appraiser of quilts made before 1960 and the owner of her own business, Julie Silber Quilts (formerly The Quilt Complex.) 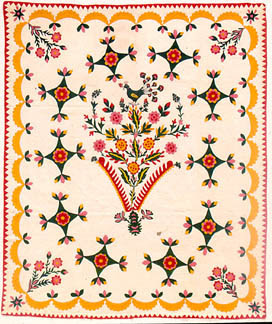 Julie offers a wide range of antique and vintage quilts made between 1800 and 1950. 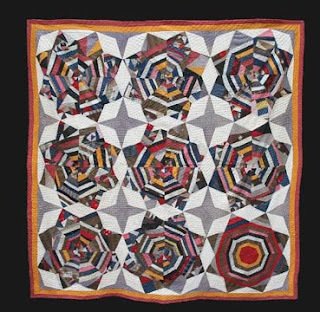 She has been selling antique quilts to businesses, museums and individuals since 1968. Julie is perhaps best known locally as curator of the world-renowned Esprit Quilt Collection which was on display at the Esprit company headquarters in San Francisco in the1980s. She is an author of one of the classic books on quilts, Hearts and Hands, The Influence of Women & Quilts on American Society, and of Amish: The Art of the Quilt. Julie has recently relocated to Albany, CA. You can contact her at silber.julieellen@gmail.com.